Property Size 2,189 sq. ft.
New Owners and recently Renovated! Located in Gated Community of Emerald Shores with Private Beach Access, 2 Pools (one heated), and Tennis court. First Floor: Living Room with Twin Sleeper Chair, Kitchen, Dining, King Bedroom with En-suite Bath, Laundry Room, Access to the side porch. Second Floor: King Bedroom, Bedroom with Full bed and Twin Bunks, Full Bath, both Bedrooms have Balcony access. Third Floor: Features an oversized room with King Bed, Full Bath and Queen Futon. Also large Balcony with partial gulf views. EMERALD SHORES is a true Gem in Destin. Great location, on the first street closest to the beach, just about 125 yards to the White Sands and Emerald Green waters of the Gulf of Mexico. There are 3 restaurants in walking distance and several Golf Courses Within 1-5 miles. 2 Huge Shopping areas nearby with Movies, Dining and Entertainment. Spring and Summer you can enjoy the Beach trolley, but you are so close to the beach you really don’t need it. 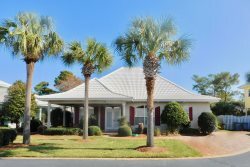 EMERALD SHORES has two community pools (one heated), tennis court, and a private beach side pavilion with restrooms, showers, a Sunbathing deck with Lounge chairs and Picnic Tables. Food and Drink Service also available during Peak Seasons at the Beach Pavilion. additional Beach Chairs and Umbrella can be rented by the day or week. Up to 12 people can comfortably enjoy privacy, as well as get together in the large kitchen, dining and living room area. Partial views of the ocean from the 3rd floor. Just steps from the Sugar White Sand and Emerald Green Waters of Destin, Florida. New Hi Def flat panel Televisions are located in the Family Room and all 4 bedrooms. The kitchen is completely stocked if you wish to create your own home-cooked meal or grill your fresh catch-of-the-day. This Destin Florida Vacation beach rental is located close to all of the entertainment that Destin has to offer. Major golf courses, the Silver Sands Outlet Mall (the largest designer outlet in the nation), Destin Commons (open-air village featuring upscale shopping, casual and fine dining, and a 14 screen movie theater). Don't Know Destin? You are in for a treat! Best known for the "Luckiest Fishing Village in the World". Our sand is white powder soft Sand and Emerald Green clear Waters. Travel the world and you won't find better Beaches. Destin is a small Coastal town but has so much to offer, Fishing, World Class Golfing, Dining, Shopping, Beautiful Scenery, Biking, Family Entertainment and great Night Life, Watersports plus so much more! Check out "Crab Island" for a great day of fun on the water, or stroll around Village of Bay Town Wharf or Harbor Walk where you will find yourself surrounded by water, Shopping, dining, entertainment, so much fun for Kids of all ages. Our Managers are local and are available 24/7 to assist in anything you need while you are on vacation. Just come, relax and enjoy all that Destin has to offer. *** Note: $20 per stay fee for entire group and length of your stay to use Pool Tennis or Private Beach. See Beach Attendant for wrist Bands. The Destin Comforts team is very friendly and easy to work with. We had a great trip! Thank you Destin Comforts! Pool bands must be used for pool use, tennis courts or beach access. Please check in with pool or beach attendant to pay the $20 (for whole group fro your entire stay) this is non refundable.